4 MARCH 2019 • BIGGROWER.COM COVER STO RY Back then his parents were growing cuttings on the patio for their own garden. In the summer of 1962, they made their first commercial sale. Nowadays, the company sits on 33 acres of former orange groves in Winter Garden with more than 25 acres of production space. In the early years, they were growing woody tropicals. Then as the industry changed, they started brokering bedding plants that were sold at some of the larger regional retailers. In the 1980s, the decision was made to also start growing plugs "while keeping a balancing act of selling bedding plants to mass merchants." Currently, the company's primary business is supplying young plants to growers, and also providing finished plants to landscape companies and many of the theme parks in central Florida. The company also produces EZ-pots, its own brand of Ellepots — degradable paper pots (see sidebar). In 2015, the company was also one of the first growers in Florida to receive a license to grow cannabis for medical use through its affiliated company Knox Medical. For years, the company was known as Knox Nursery but changed its name recently to Knox Horticulture (see sidebar) to reflect the how the business has transformed in more than five decades. "It's really interesting to see how the industry has changed over the years," Knox says. From specializing in specific product categories to adjusting to the industry consolidation of both growers and suppliers, Knox Horticulture has always been able to adapt and take advantage of the opportunities that present themselves. "It's kind of scary to think of how much change the industry has seen [over the years]. What is this industry going to look like in 20 or 30 years?" he asks. "It's going to be very interesting." And Knox and Mullen are up for the challenge. PRODUCT DIVERSITY, MOTHER NATURE AND LOCATION, LOCATION, LOCATION Knox says one of the biggest strengths the company capitalizes on is the depth of its product offerings. 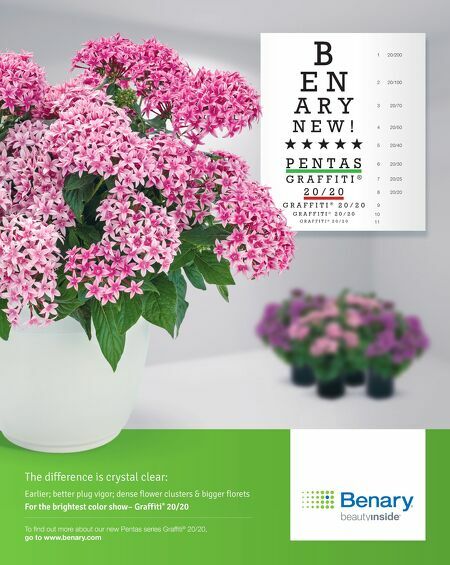 Knox Horticulture offers its customers more than 5,000 different products. It is an open propagator that works with a wide range of breeding organizations, seed companies and cuttings producers. "We have such a diverse customer base, from customers that only buy one box at a time to those customers that order an entire truckload," he says. While he doesn't like to call the business a one-stop shop, Knox says the company specializes in providing its customers with different solutions to meet all of their product requirements. "Our customers come to us to fill all of their needs — whether it is seed or vegetative and combine things," Knox says. This way they can be flexible with their product orders to meet minimums for rack deliveries. Knox says thanks to its Florida location and Mother Nature, Knox Horticulture is able to stay ahead of the rest of the market as a young plant producer. In 2015, Knox Nursery was awarded one of the original licenses to grow medical cannabis in Florida. Because of the complexities and legal requirements involved with applying for and holding a license to grow cannabis in the state, Knox Nursery changed its name to Knox Horticulture in 2018. Not knowing how the requirements for medical cannabis licensees might change in the future, Knox made the proactive decision to create two separate entities — Knox Horticulture and Knox Medical — just in case the name "Knox Nursery" would always be required to be on that license. "I think Knox Horticulture is more representative of who we are today," Knox says. "We are no longer a nursery. We are no longer growing the 3-gallon woody tropicals that my parents focused on when they started the company. And I think it was just time for a change." He adds the new name allows the bedding plant producer to be flexible going forward and adapt to future changes. 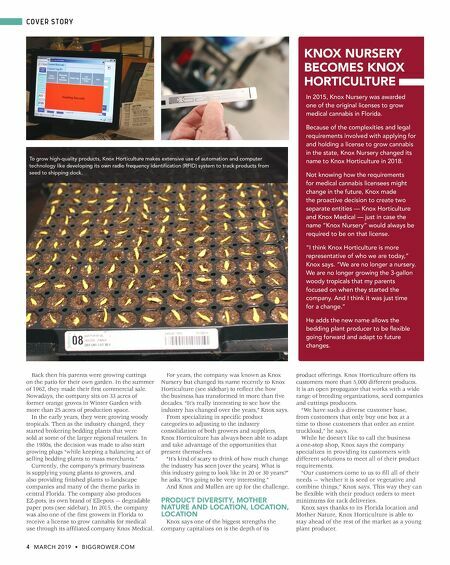 KNOX NURSERY BECOMES KNOX HORTICULTURE To grow high-quality products, Knox Horticulture makes extensive use of automation and computer technology like developing its own radio frequency identification (RFID) system to track products from seed to shipping dock.